In the last article by Adrien Boudin, TIMEZERO Ambassador, he told us about his trip on the Kata Lind from Iceland to Brest, France where he had to cross the busy shipping lane. The real problem with this crossing is that the workboats really do arrive in quick succession and they all seem to vary their speeds greatly (some at a canter of 10kn and others steaming in at 23kn) making it difficult to judge how much time is available between each boat. With the AIS connected to TIMEZERO which displays the targets on the charts, there is no longer any problems. We see straight away the distance of each workboat, if we pass in front or behind, how much time we will have. The shipping lane crossing becomes a formality with this snazzy feature. We are safe, and we don’t need to annoy anyone. Everyone is happy. “an example of the workboats that cross this busy shipping lane. This one in particular crossed just 600m from us” A.B. I arrived in Brest for the 2016 Armada in perfect time. A great sail, no problems, only good memories. The last 36 hours I only sailed in an average of 8kn winds, a little light, but Kata Lind still sails strong in these conditions. It was foreseen in any case. The crossing was done at around an 8kn average. After a weekend surveying the armada in Brest, I left Tuesday accompanying all the boats. What a day. I had navigated by all different sorts and shapes of boat, little, large, giant… From old school tall ships to modern day racing breeds such as carbon mod70 or open 60. So great. The Kata Lind was born in Iceland and in Iceland, there must be somewhere around only 20 sailboats on the island, which isn’t a lot. Kata Lind was a little lonely, but in this one trip with the Armada of Brest, Kata Lind got to see more than her fair share. More than 1000 boats on the water and at times not more than 2m between each boat! It was amusing to see TIMEZERO, even though it wasn’t useful in this particular scenario due to the enormous amount of boats. In these conditions, no instrument can be useful, simply because the rules of sailing go out the window and common sense and vigilance must be employed. But having said that, TIMEZERO showed all the boats equipped with AIS without hiccup. On this subject, I would like to say that the reliability of TIMEZERO impressed me. I write this the 19th of August, it’s been more than a month and a half that I have left Iceland. One month and a half that the dedicated computer with TIMEZERO has been running around the clock. I never turned it off, never restarted it, never had the slightest glitch, bug, nothing and when I don’t sail, TIMEZERO has the mooring alarm running. That’s why it has been running nonstop, given that I haven’t been into a port within all that time. It’s good. Moreover, my dedicated computer with TIMEZERO running is using an ATOM processor. For the non-initiated, an ATOM processor has the same capabilities more or less as a smartphone than a computer at work. But it consumes next to nothing, 6Watts instead of 45-60Watts used by the average desktop. Without a dedicated graphics card, TIMEZERO runs fluidly in these conditions, even with all the AIS targets around me! After having passed the morning and early afternoon with all these boats, taking it all in, I started to make my way to La Rochelle. I would have to pass by the Raz de Sein is a stretch of water located between the Isle of Sein and the Pointe du Raz in Finistère in the Brittany region of France. It’s an area that gets the hairs standing up on end, just from the name. The currents option displays the currents on the TIMEZERO chart and in Brittany, it is extremely useful. It was the first time that I navigated in Brittany and I can now say that these currents really are worthy of their reputation. 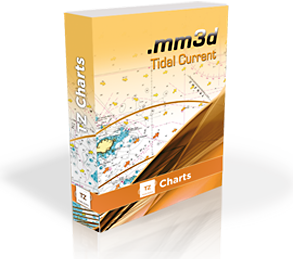 To be able to see the currents in real time or in the future on the chart, it is of great help. Arriving in Brest and the Raz de Sein is difficult enough as it is, so having currents information at hand that are reliable is really important. In my scenario, the Raz de Sein currents were directly going against my heading, so I decided to make the tour around. Not a problem when you have a boat that can do 8kn in 6-7kn winds. The currents from the Raz de Sein in TIMEZERO. Be careful, they have a tendency to throw you onto the rocks. The currents in the Raz de Sein. From a quick look, it doesn’t look doable. It will be necessary to go around. We will have to see the lighthouse from close up another time. I can assume that stopping off in La Rochelle was a great time spent with old friends and with many stories to tell of his trip in the various drinking holes of La Rochelle. Our software for recreational users also provides the AIS/ARPA feature and furthermore, you can use a tool to highlight a shipping lane so that no nasty surprises occur. To know more about the features available for TZ Navigator v3 and TZ Professional v3, visit our product pages. As Adrien explained, the currents have rightly earned their reputation along the North Atlantic Coast. Adrien was able to use the information from the currents functionality to see that these currents presented a very real danger, and then make the informed decision to go around the islands. TIMEZERO collaborated with Marine Traffic to ensure that AIS/ARPA can be tracked within your TIMEZERO software. Download this mini-guide which will explain how to set up your Marine Traffic account and have it up and running in your software in no time at all!